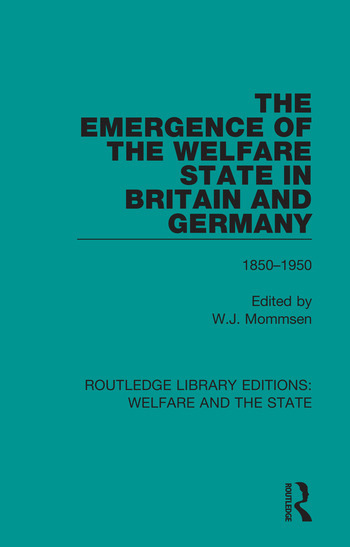 Originally published in 1981 The Emergence of the Welfare State in Britain and Germany 1850-1950 is an edited collection on the history and future prospects of the modern welfare state. It attempts to pave the way for an analysis of the problems of the welfare state and its historical origins, and the likely future that transcends the nation-state orientated historical accounts. This collection of essays seeks to promote an interdisciplinary approach to the problems of the welfare state in two industrial societies. So far historians and social scientists concerned with this field of research have tended to work in isolation from one another, without mutual exchange of knowledge and using different methods. This book attempts to give equal scope to both perspectives. Wolfgang Justin Mommsen was a German historian. Mommsen's overall work reflects three major shifts in post-war German historiography. First, as the primacy-of-domestic-policy thesis gained ground, Mommsen placed particular emphasis on the domestic factors that influence policymaking under the Bismarckian, the Wilhelminian, and the Third Reich. Second, by using his experience from the study of Imperial Germany to shed light on the problems of interwar Germany, he underlined continuities in German history and contributed to the historicization of the Third Reich. Finally, although Mommsen located certain peculiarities in the German state and society, he treated German history, not in isolation from, but in firm connection with historical developments in the rest of Europe.